In a large pan over a high heat, heat a little oil and add the garlic, chilis and ginger, saute for about a minute. Add the onions and curry leaves and cook, stirring constantly until the onions go traslucent and soft. In a large pot heat a little more oil and add the spices, chili powder, turmeric, garam masala and coriander and fry, stirring constantly for about 2-3 minutes. Now add the onion mixture, potatoes and chicken pieces and combine the ingredients well. Now add the coconut milk, season with salt and simmer for about 30-40 minutes or until the chicken is done. Lastly add the yoghurt, mix well and simmer for about another 10- minutes. I have been using your recipies for a few years now and am on your mailing list. With the effect of inflation on our pension, we have all had to pull back on our living standards. I always find something which can fit into my meal budget. Perhaps we need a pensioners section like your “end of month” recipies. Just a note to thank you again. Hey Graham,I am dumbstruck.Did u really make the curry in the photo that u have posted?If u did,then I am sure that u r an awesome cook.Its exactly the way we make at home back in Kerala.My husband loves this curry and was impressed when he saw the photo and the recipe 🙂 Excellent work. Hi Graham. 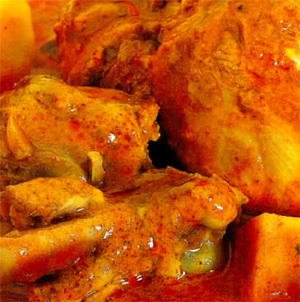 Loved the Kerala Country Chicken – my whole family did. I left out the two chillies though and it didn’t seem to make a difference. Thank you so much. Another place to try to spices is Osmans in Gatesville, just off Klipfontein Road. Have lovely weekend. You really choose the recipes you send with lots of thought. Most appreciated. Just wanted to say thanks so much for the amazing recipes. I forwarded your website to our local Butchery so that they can give out recipes with meat cuts. I also include a recipe in my weekly Info email to our local Community – these are appreciated by all the people who enjoy cooking and so on.